Bonaparte and Charles Waterton had been on good terms ever since the ships they were traveling on collided in June 1841, an accident that resulted in their reconciliation after some earlier hurt feelings. Gould, of course, is John Gould, the English artist and entrepreneur, a frequent go-between for Bonaparte and his colleagues in Britain. This little book passed through some pretty famous hands before it somehow made its way to Madison. 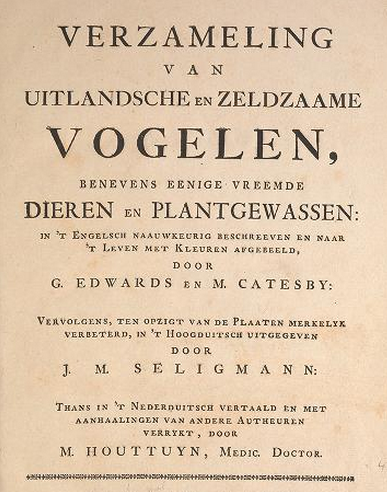 The famous Strasbourg naturalist and collector Jean Hermann was also a dedicated bibliophile. His personal library — eventually the foundation of the library of the Strasbourg Museum of Natural History and now in large part held in the university library of the city — was notable for its completeness and for the care with which he annotated the books, many of them in great and obsessive detail. the images are missing in the German edition of Reyger, though that is the more authoritative text of the two, so much so that it is worth acquiring both editions. Among those engravings are some of the most uncanny images in the history of ornithological illustration. 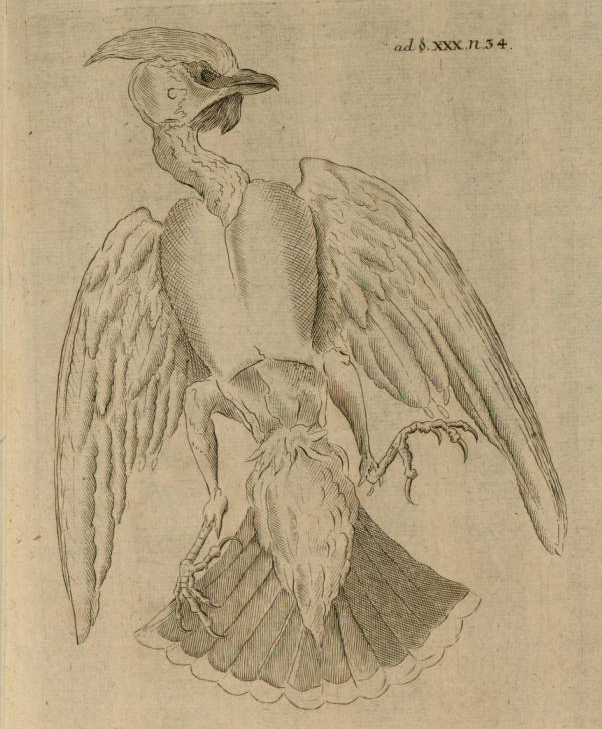 This one in particular, depicting the early steps in the dissection of a Bohemian waxwing, strikes me as the inspiration for a fine costume for Halloween. 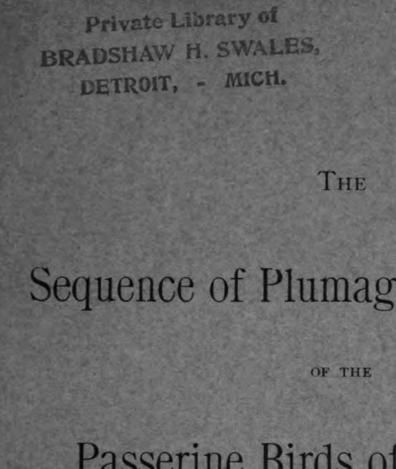 There’s a name familiar to Michigan ornithologists and birders: Bradshaw Hall Swales. 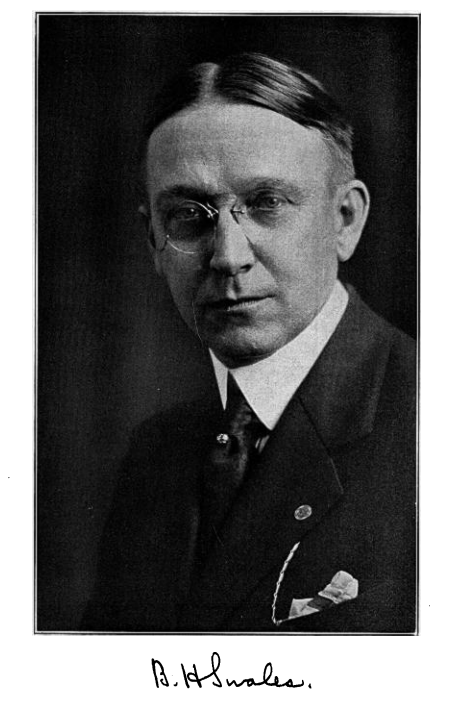 On his premature death in 1928, Swales left some 2000 skins and his entire library to his alma mater michiganensis, which in gratitude renamed its ornithological holdings as the Swales Memorial Library. His widow, Mary Rhoda Medbury Swales, later endowed a graduate scholarship in ornithology in Ann Arbor, one still awarded today in her name — though the annual announcement barely mentions her otherwise, treating her as the wife of a famous dead man instead. 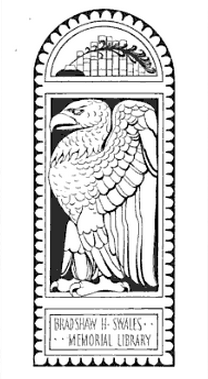 Others, though, still carry his bookplate, as delightful a specimen of the genre as can be imagined. 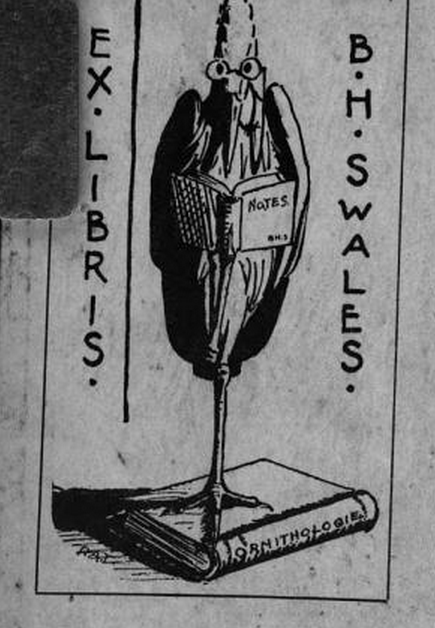 I assume the choice of a marsh bird was a pun on Swales’s name; note that both the heron and the book’s owner are wearing the same spectacles. One thing still puzzles me, though. Why does the bird of the swales perch on “Ornithologie”? The fact that the word on the spine is not in English suggests that it denotes not a discipline but a title, that the heron is standing on a specific book from Swales’s collection. 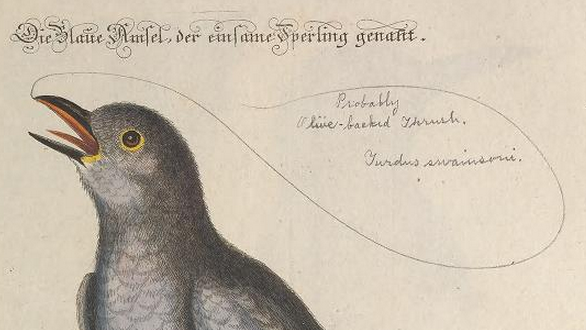 Mark Catesby’s Natural History enjoyed a surprisingly vigorous Nachleben in the eighteenth century. Among its many continental reflexes was this Dutch work, published in the 1770s and incorporating Catesby’s work into a whole vast kaleidoscope of “foreign and curious” birds. This copy, available on line at the wonderful Biodiversity Heritage Library, now lives in the Smithsonian Library. I know nothing about its provenance, but I do know that one user treated the book with rather less respect than it deserves. 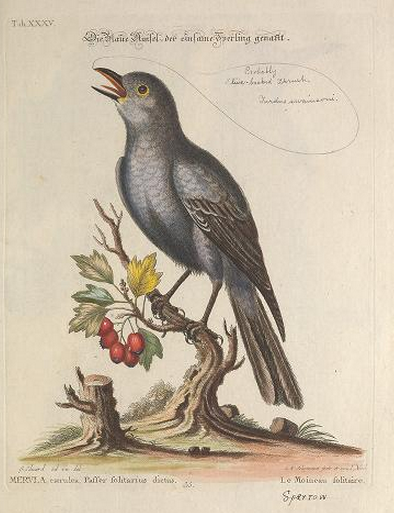 Plate 35 is, well, exactly what the captions, German, Latin, and French, say it is: “the blue thrush called the solitary sparrow.” (The top caption is in German because Houttuyn was working from Seligmann’s translation.) The “solitary sparrow” is an old name for the blue rock thrush, as all Italian schoolchildren know. But our not so pius commentator didn’t get it. After helpfully translating the French “moineau” at the bottom of the leaf, he then drew a speech bubble coming out of the bird’s open bill. The bird itself speaks its identity, “probably olive-backed thrush, Turdus swainsoni” — our Swainson’s thrush. If you’re going to deface a book, at least get it right. What would any of us do without the Biodiversity Heritage Library? Those millions of scanned pages answer questions we might not even have dared ask twenty years ago, and I can’t count the hours of sloggery and the gallons of gasoline they’ve saved me. Every once in a great while, though, one runs across a scanning error: a pudgy thumb across the text, a blurry page, even — on the rarest of occasions — a missing leaf. Sometimes what is not here truly was not there: not every old book has come down to us intact. But most of the time the pages were simply flipped too fast and something was missed. Happily, it’s easy to report problems like that, and the response from members of the BHL staff is always prompt and helpful. And sometimes, in the meantime you can help yourself. 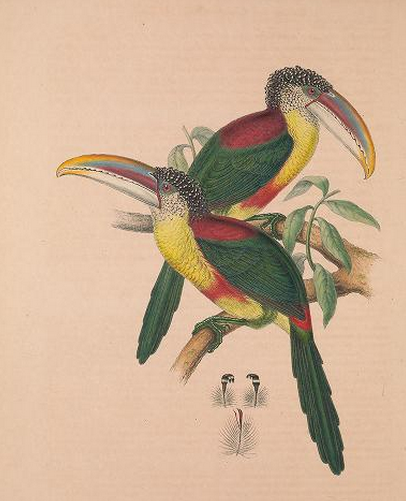 Lately I’ve become interested in the history of the toucans, a group second only to the hummingbirds in their power to conjure up the exotic for European naturalists and collectors. Pickin’s are otherwise slender from those early days, and so I was excited to run across a reference to another example, a painting published in the Magasin de zoologie in 1836. And of course the BHL includes the Magasin. But somebody at the Museum of Comparative Zoology nodded at the scanner, and the digital book goes from Plate 61 — a handsome magpie shrike — to Plate 63 — a great shrike-tyrant. 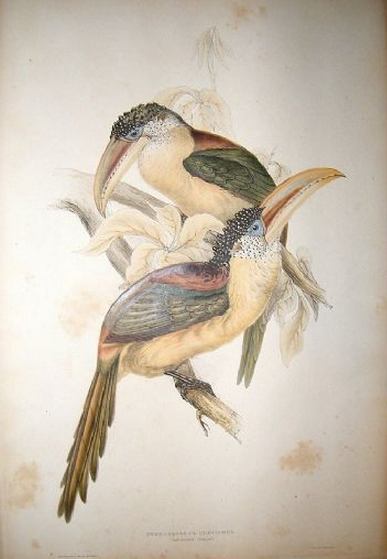 The aracari was Plate 62. The plates in this volume of the Magasin bleed noticeably through the paper, leaving the ghost of a mirror image on each otherwise blank verso page. This one does, too: our Plate 62 may be missing digitally, but it was clearly present physically. Pretty it ain’t, but it’s good enough to answer the questions I had wanted to pose of the image. 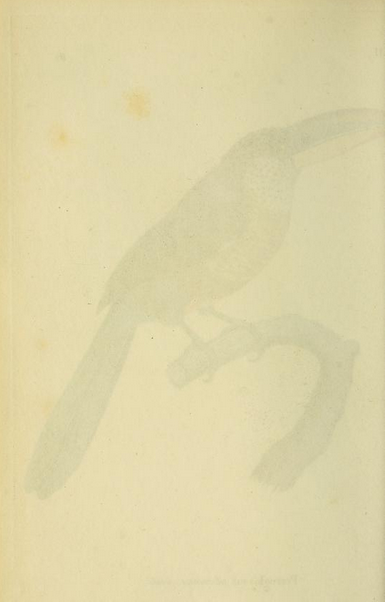 First, the nomenclature used is that of Gould’s first edition, in which the bird is called Pteroglossus ulocomus. And second, more importantly, the image is not based on Gould’s, but is an original (if not overly imaginative) composition. The explanatory text accompanying the plate is preserved on line. We learn there that this specimen, “the first of this pretty species” to be brought to France, and “perhaps to Europe,” was brought back by the surgeon of La Favorite from that ship’s circumnavigation of the world under the command of Captain Laplace. Aha. 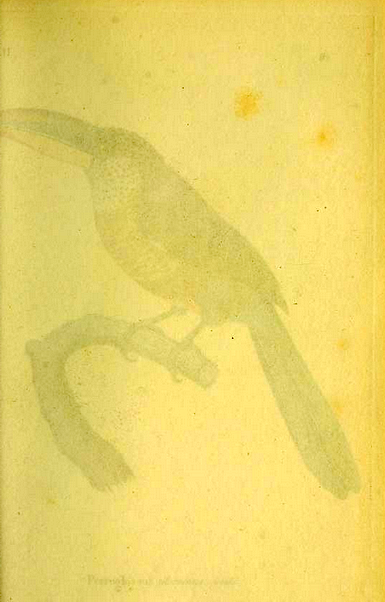 I knew that the ornithological volume from that voyage had appeared in 1839, after long delays; but was it illustrated? Back to BHL. And BHL comes through. 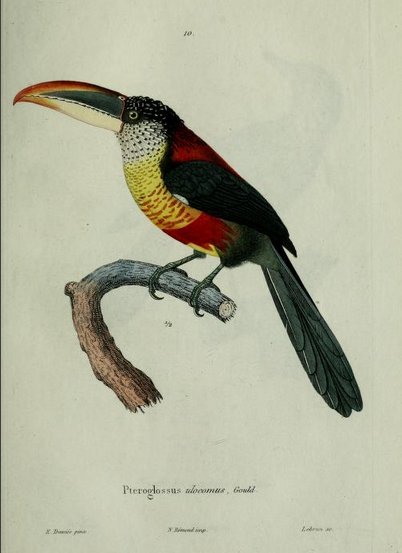 Our little toucan, the “aracari à crête bouclée,” is the very first species treated in the report, in an account taken verbatim from that published in the Magasin in 1836. And it is depicted, happy wonder, on Plate 10, engraved after a painting by Edouard Traviès. Here it is, in all its ramphastid glory. It was the long way around, but well worth it. And can you imagine how long it would have taken us if we’d had to go to the library — the old-fashioned kind, I mean?